It seems like the rest of the blog world is finally discovering the awesomeness of the Sewaholic Hollyburn skirt. I made this one up at the end of last summer and this skirt immediately became a wardrobe staple for me. It’s the View B length. Hollyburn is a Sewaholic Pattern which means it’s designed for pear shapes..which I definitely am not! However it was very easy to tweak the pattern to accommodate my lack of a waist. When sewing pants or skirts Sewaholic patterns you definitely want to pick a size that fits your hips and then adjust the waist. Waist adjustments are generally the easiest. In my case my hips fit a 16 but my waist was bigger. I figured out the difference and used the slash and spread technique to make the waist larger. In order to calculate this you need to take the difference, let’s say 2″, and divide that by 4 to get 1/2″. This is how much will need to be added to the front and back skirt pieces to get a total of 4″. This does slightly distort the half circle shape but with such a small adjustment it’s not noticeable. You’ll also need to add to the waistband. 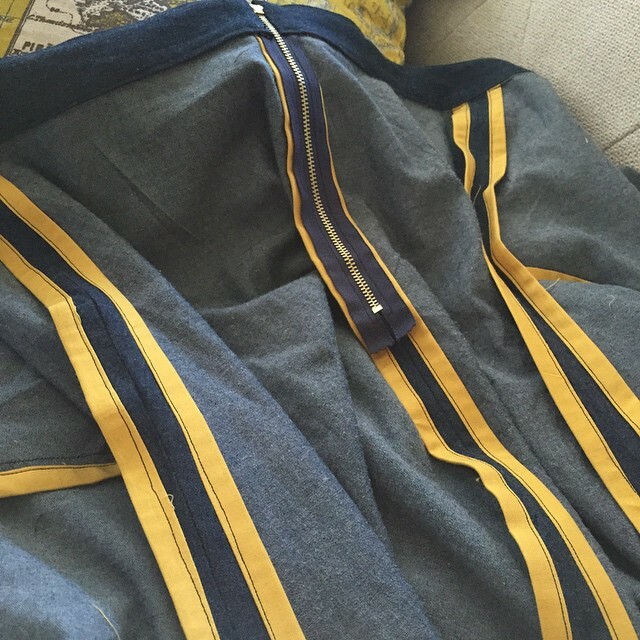 This is cut on the fold so just add half of your waist difference (2″/2 = 1″) to the end of the waistband piece. If anyone is interested in seeing how this was done, leave a comment and I will do a post with some photos. 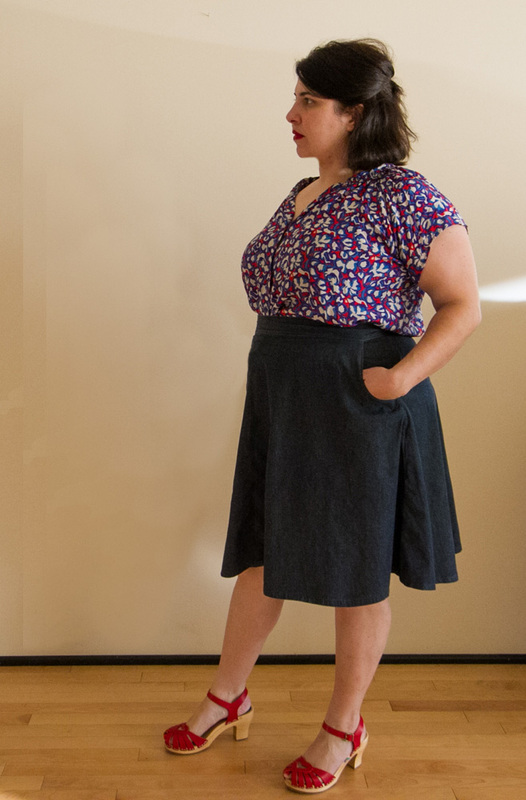 The fabric for this skirt is a lightweight denim I picked up at Joann. To keep with the denim look I used a jeans zipper on the back. I like seeing the slightly exposed brass zipper. I finished all of the seams with self-made bias strips and a Hong Kong seam finishes. This a style that requires tucked in or cropped shirts. I’ve found that leaving something untucked just looks frumpy as it squashes down all the fullness around your middle. 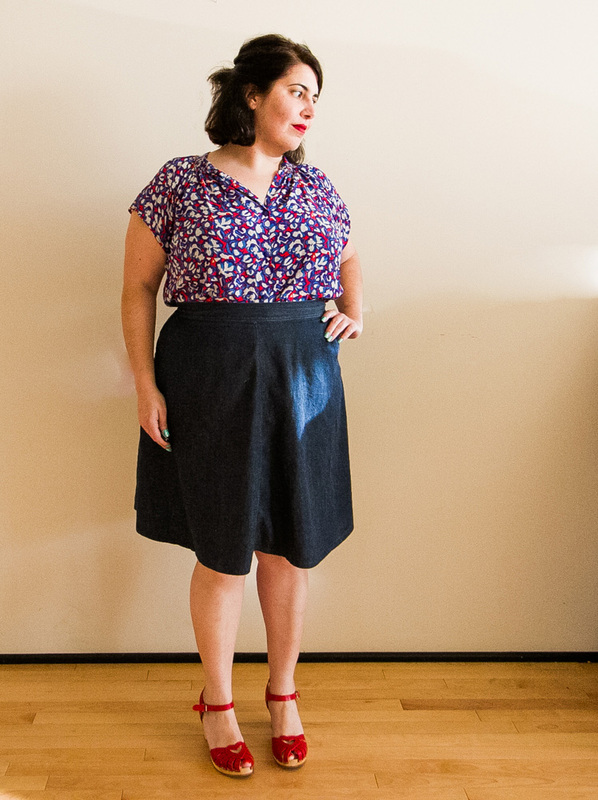 I’ve been thinking I need to make some Closet Case Files Nettie bodysuits to wear with this skirt! In the meantime I wear it with my silk Tucker blouses for work and with slim fitting JCrew t-shirts or tank tops for more casual settings. I think this skirts has a slightly 70’s vibe that works great with chunky platforms or sandals. View C is a shorter flirty version that would be very contemporary and festivalwear-like in a girly floral print. Adjustments needed to make waist fit. (This is expected with a Sewaholic Pattern). One last note on this pattern. It’s based on the lovely Sewaholic Lonsdale dress. I own both patterns so I compared the skirt pieces and they are totally identical! So if you like the Lonsdale too, just buy that pattern and you can make both! All you’ll need to do is make your own rectangular waistband pattern piece, which you can base off of the one on the Lonsdale. This skirt looks fabulous on you! This looks fantastic on you! I’m shaped similarly and so afraid of tucking in anything. But wow….so flattering! Thanks! I think the key here is that it’s a full skirt that is not bulky around the waist. A gathered or dirndl skirt wouldn’t work as well, as the half cuticle. Thanks for the tip on the pattern. I own the Lonsdale so I am going to now try a Lonsburn!